Beach front property located on Rua Avenue, Waitarere, the road that runs along the beach front. You can see the sea from the top of the sand dunes, in front of the house. This property has been in our family since 1994. The property has it's own swimming pool with changing room which contains an extra toilet and shower (by the pool), in addition to the one in the house. There is a double garage and a three bedroom house. This is an older style beach front house, two of the bedrooms are small and have 2 single beds in each room and the main bedroom has a queen bed. Bathroom and Laundry: There is a shower over the bath, a handbasin and a small inbuilt wall vanity cupboard, this area also contains the washing machine and large laundry tub, the house toilet is off the bathroom/laundry and is separate, all older style. The property is due to be re-carpetted in 2018 but meantime has all new beds, new curtains and blinds throughout and is comfortable. If you want a holiday in a comfortable Kiwiwana style beach front home with your own private swimming pool, then this is the place for you. The TV has the standard freeview channels with inbuilt dvd and radio. Free Wifi provided. Families preferred. Even though, you have pre-paid your accommodation, as owners of the property, we require a valid credit card details and expiry date for security purposes, this can be done over the phone or through our secure webpage. See terms and conditions for secure webpage link for your credit card details. If you do not supply these details then the booking cannot proceed. We reserve the right to validate your credit card. Property is right on the beach and pool was great to use on the days it was windy down the beach. 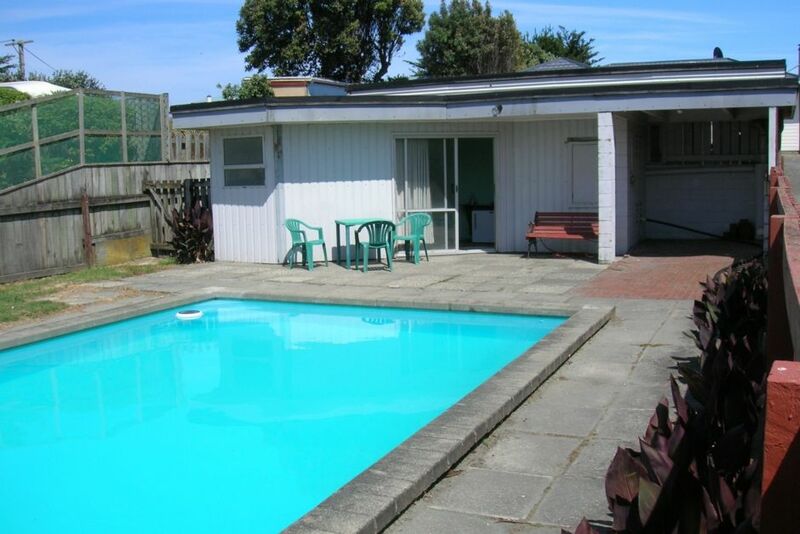 Great location just behind the dunes; close to forest and playground; quiet; big pool and lawn for the kids to play; good sized lounge and handy breakfast bar.